A sweet piece of kiwi art for your wall, for a special ex-pat in your life, or even a thoughtful wedding gift?! This print of New Zealand can pin-point where your heart lives on the map – quite literally, with the heart being moved to where you specify. The text will be personalised to your names and location. Modern white text contrasts against a beautiful deep blue background. 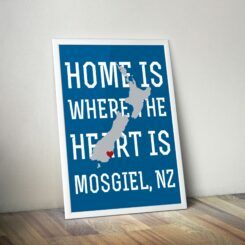 A light grey silhouette of New Zealand takes center stage, and a rich red heart pinpoints where your heart lives within the land we call home. A sweet piece of kiwi art for your wall, for a special ex-pat in your life, or even a thoughtful wedding gift?! This print of New Zealand can pin-point where your heart lives on the map – quite literally, with the heart being moved to where you specify. The text will be personalised to your names and location. printed onto high quality paper and delivered ready for you to frame. Note: all accessories and frames in product photos are not included, and are only pictured for the purpose of illustrating what the end result may look like. For a detailed example of what the stretched canvas looks like, please see images at the bottom of this page under the heading “Stretched Canvas Prints”. We love our “Home is where the heart is” custom print! It was such a rewarding feeling putting it up when we first moved into our home and it looks great. As always, quick and reliable service by Amanda.